We had been lucky in choosing dates in May when HRH Prince Charles’ House Highgrove has the garden open for tours, and an optional Afternoon Tea. I purchased tickets in advance and they mailed us little blue boxes with our tickets and instruction. A lovely presentation. If you know anything about Highgrove you’ll know that HRH Prince Charles is an advocate of Organic & Biodynamic Farming & Gardening. Off we set for Tetbury. There are strict rules for a visit to Highgrove. The first being that you are not allowed to arrive late, nor are you allowed to arrive more than 10 minutes early. We had a 40 minute drive and somehow managed to time things perfectly, despite completely missing the entrance. Highgrove has high hedges and fences and there are no signs. The driveway we were guided to, is a back one, much like you would expect deliveries to use. It’s marked Private Drive. Visitors must show identification at the gate where armed guards await. Once you are passed through you must stay with the group at all times and no phones, videos, or cameras are allowed. Visitors meet in a building built by the Prince for functions not too far from the main house, and it’s also where the afternoon tea is served. The good news is Prince Charles’ garden is delightful. It’s my kind of garden, wild and whimsical. The meadow of wildflowers is truly inspiring. You do get to see the outside of the house and the gardens close to it. Really the only thing we didn’t see were the farm/utility buildings. The Afternoon tea too was lovely, accompanied with Champagne and a pianist. Trent had Highgrove apple juice. 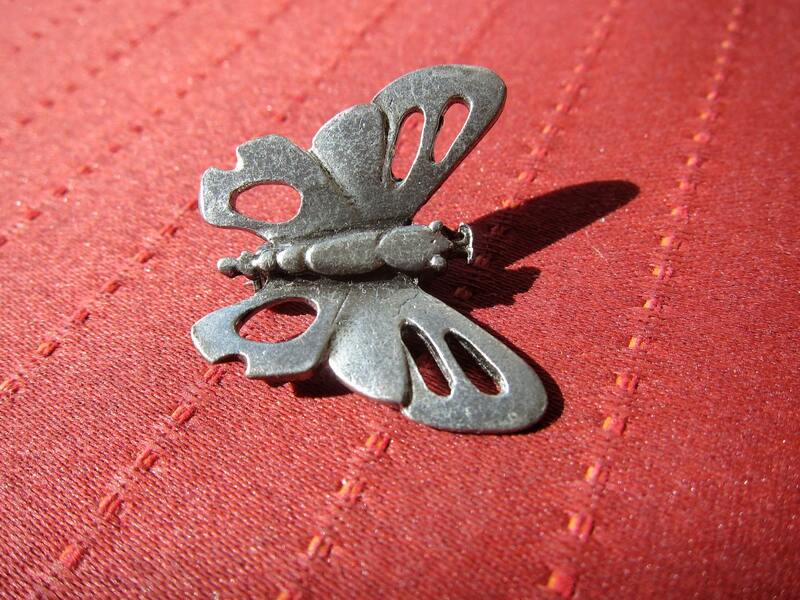 All the proceeds go to the Prince’s Trust charities. So how do you follow up on that experience? More garden walking of course. 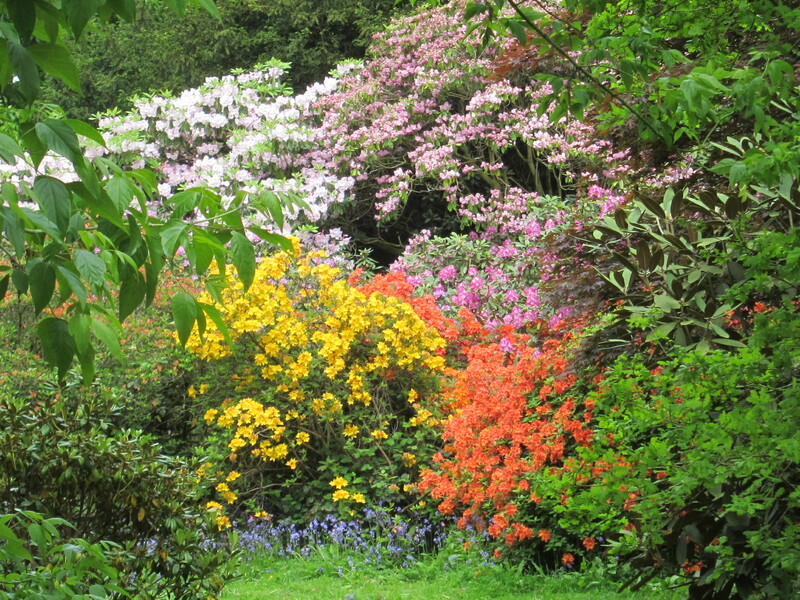 We had passed an Arboretum on the way to Tetbury so we headed back to it. 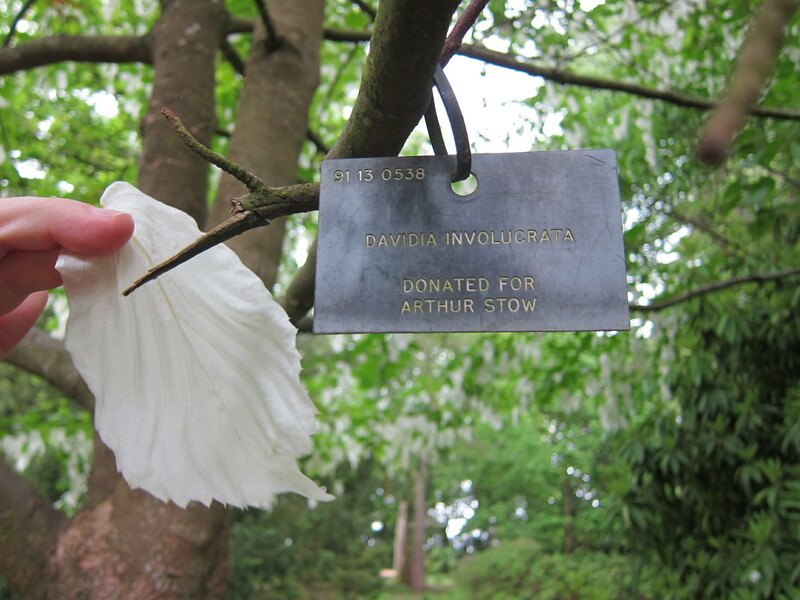 At Westonbirt Arboretum, armed with raincoats, we were dazzled by the Rhododendrons and by the truly stunning “handkerchief tree” a Davidia. 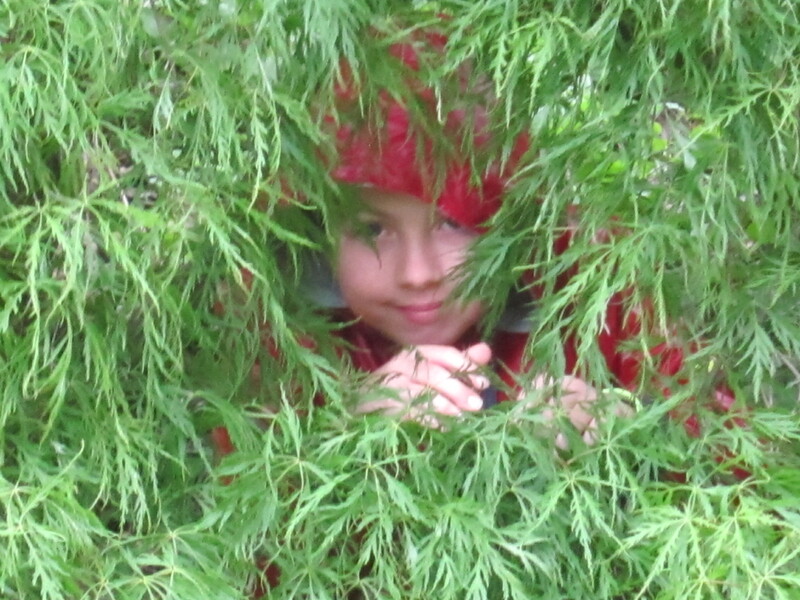 T had a great time running around and hiding amongst the Rhododendrons and Japanese Maple Trees. 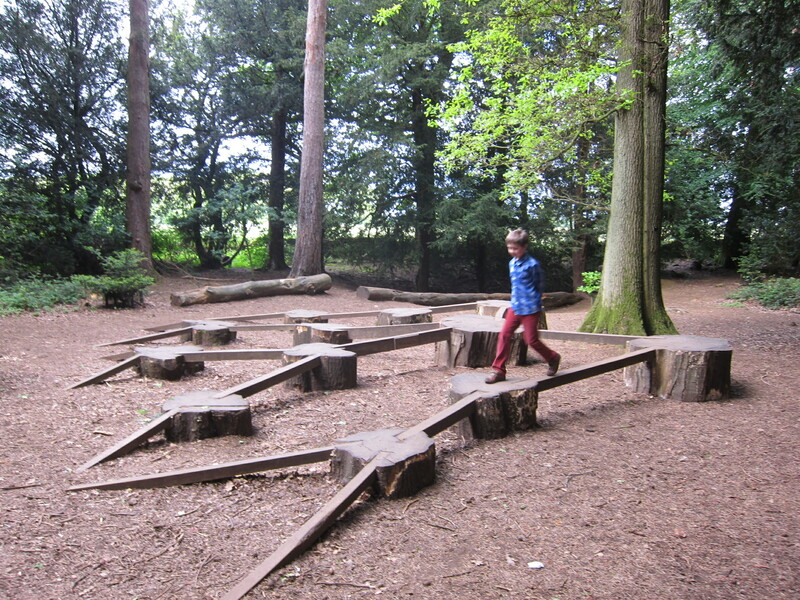 There were some activity bases scattered amongst the plantings and so T had fun trying them out. At the shop, I bought a wool throw to accompany us into the north (good thing too) and we set off for ‘home base’. 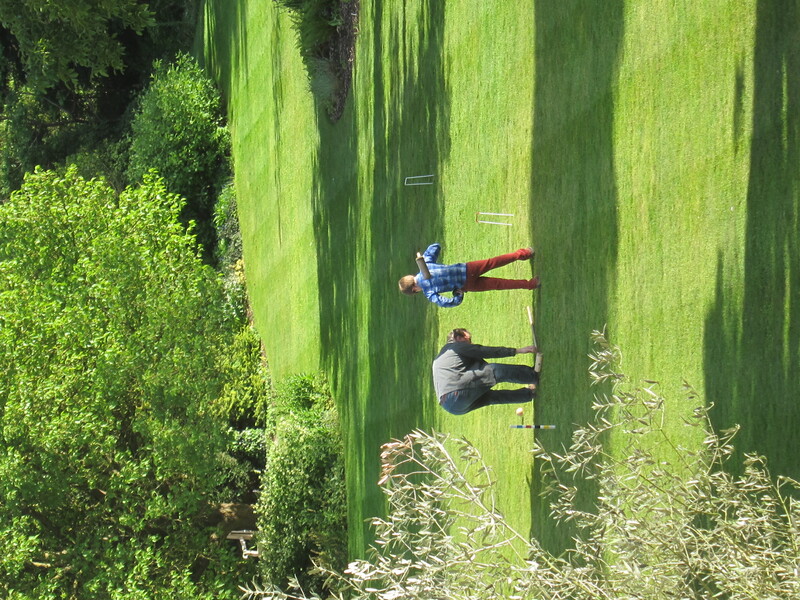 Back at the Bath Priory we had a sunny afternoon and the boys went down to explore the gardens taking in a few rounds of croquet, before dinner. Dinner at the Bath Priory was a multi-course pricey affair, but exceeded our expectations. After dinner we arranged for some wine from their cellar to take with us & a picnic lunch of sandwiches for our trip to The Lake District the next day. Next up: Rainy Days in the North.